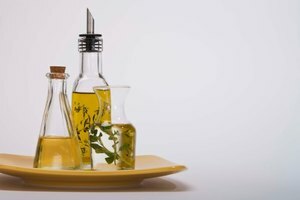 Olive oil and vinegar are typically used in everyday kitchens to add flavor to foods, as a dressing on salads and a dipping sauce for breads. It may be tempting to store oils and vinegars in the tall clear glass bottles in which they came and place them on display on your kitchen counter, but that is actually one of the fastest ways to make them go bad. Oil and vinegar are sensitive to air, heat and light. It is best to store them away in a dark cool place until you need to use them. Pour olive oil and vinegar into separate glass cruets. 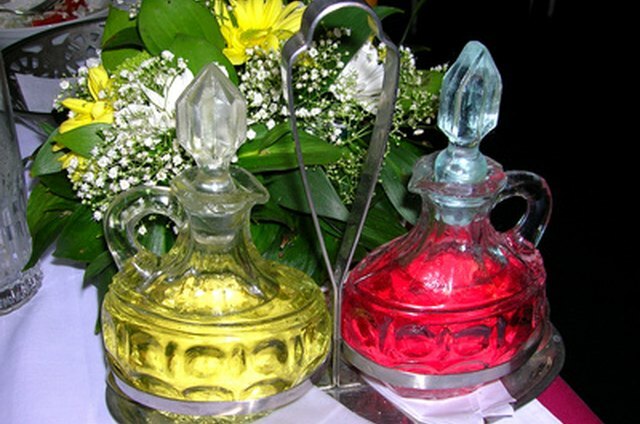 Cruets are flask-like containers with long necks ideal for pouring or drizzling. Glass cruets for oil and vinegar can be found at specialty kitchen stores, often in matching pairs. Never store olive oil or vinegar in plastic containers, because the chemicals used to make plastic can be absorbed into the oil and vinegar, becoming dangerous to consume. Olive oil can also be stored in tin or ceramic containers as well, but vinegar should never be placed in a metal container or even a container with a metal top because metal reacts to the acids in vinegar, spoiling it. Tightly seal the olive oil and vinegar containers. 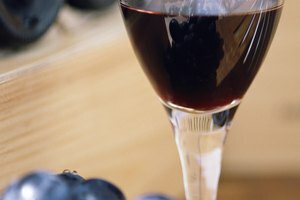 Too much exposure to air will damage both olive oil and vinegar due to excess oxidation. Buy glass cruets that come with a pouring spout, which will have only the smallest opening in which to drizzle out the oil and vinegar. Store olive oil and vinegar in a cool and dark environment. Too much exposure to light will damage the oil and vinegar, which is why they should also be stored in tinted glass and not clear glass. In addition, keep the containers away from the stove and any heat sources as heat can destroy nutrients in olive oil. You can refrigerate your oil for a longer shelf life but the cold causes condensation on the inside of the bottle, which can affect the flavor of the oil as well as make it look cloudy. 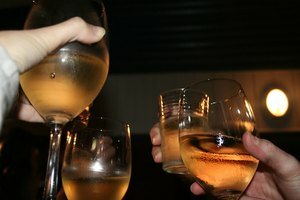 What is the Difference Between White Wine Vinegar and Champagne Vinegar? 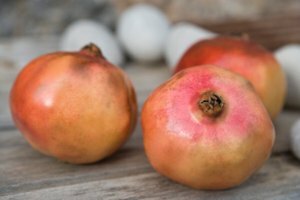 What Is the Shelf Life for Rosehip Oil?